Featured above is the architectural detail of Spain’s Great Mosque of Cordoba, renowned for these seemingly infinite striped arches. Gillian Redstone/The Miscellany News. What comes to mind when you think of visiting Spain? Probably tapas, flamenco, sangria and the cities most well known to tourists: central Madrid and to the north, Barcelona. 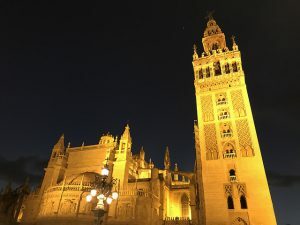 But oft-forgotten by one-time travelers are the wonders of Southern Spain— the towering Moorish castles of Granada, the architectural treasures of Cordoba and the blended cultures of Seville. These cities may be further south and require more time staring out the train window, but they are worth every minute. Granada is 260 miles due south of Madrid in the region of Andalusia, but visitors can also fly into Malaga airport nearby. Upon entering the city, I remember feeling overwhelmed, but in the best way. Driving down the tiny, cobblestoned streets in a stick-shift in search of the hotel was quite the experience, but even more exciting adventures awaited. Europe in general) that visitors book a tour or reserve tickets of some kind in advance. The site, although massive, is the one that everyone comes to see, and it can become crowded very quickly. Despite the logistics and crowds of tourists, the Alhambra is truly magical. The detail in the palace is mind-boggling—nearly every wall, floor and ceiling is covered in beautiful Arabic calligraphy relief, colorful tile work or geometric designs. The gardens are lined with cypress trees, and the courtyards are full of perfectly trimmed hedges and serene fountains that create a scene rightfully fit for royalty. Also be sure to look out for the different views of the entire city and of the palace itself. Remember to bring a fully charged phone—there are countless photo opportunities here. Above: Detail of the Alhambra palace in Granada. This wall is just one example of the opulent, detailed ornamentation of this major Spanish tourist attraction. Gillian Redstone/The Miscellany News. The rest of the city can easily fit within a day’s exploration, and the best way to do so is by simply walking around. Take the street that looks the most quaint, pop into a little store to get a feel for the local culture and check out museums that you won’t find in tourist pamphlets. However, a couple of not-to-miss attractions include the Plaza de San Nicolas, which offers stunning views of the Alhambra at any hour (be careful at sunset, it gets busy), and the Granada Cathedral. And of course, don’t forget to eat plenty of tapas after a long day of exploring. 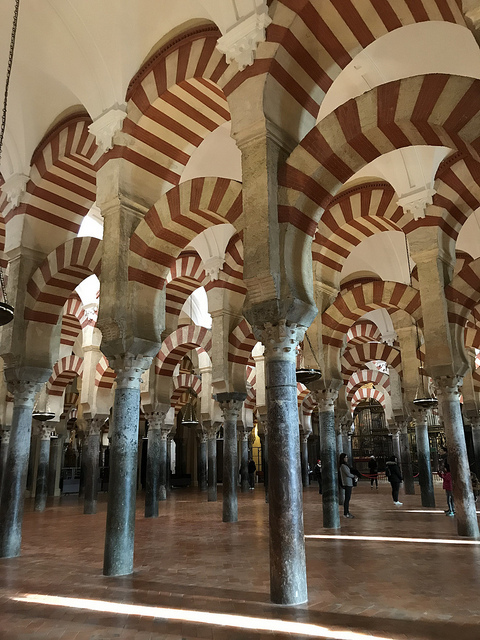 On my particular trip, we chose not to spend much time in Cordoba, but stopping to see the Great Mosque, one of the best examples of Moorish architecture, makes the trip worth it. The Mosque’s famous striped arches seem to go on forever, and the newer Christian architecture creates an incredible juxtaposition. Peer through a glass floor near the entrance to see the mosaics of an earlier church, which display how the site has been a place of worship for centuries. Cordoba is located in between Granada and Seville, so traveling to the latter city is wonderfully convenient. The city, 330 miles southwest of Madrid, is an absolute marvel. The medieval city receives a brilliant pop of color from the ever-present orange trees. Its many historic sites, some of which are in the mudejar style, create an enchanting atmosphere. This style, simply put, is a combination of Islamic and Gothic elements. The best example of mudejar is the Royal Alcazar, a site recognizable as the filming location for the kingdom of Dorne in Game of Thrones. Above: Perhaps familiar to Game of Thrones fans, The Royal Alcazar exhibits the blending of Islamic and Gothic architecture notable throughout Southern Spain. Gillian Redstone/The Miscellany News. 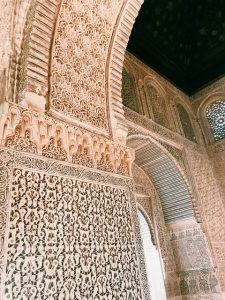 The extravagant palace was built for a Christian king, but the style is clearly influenced by Islamic art with swirling reliefs lining the walls, horseshoe arches and colorful tilework. The fountain-filled courtyards practically beg visitors to hop the rope and take a leisurely stroll. Being in the very structure made me feel like a queen. Another fantastic site in Seville is the city’s cathedral. Marketing itself as the largest Gothic cathedral in the world, the structure has towering columns, decorated organs and countless heavenly depictions. But what makes the building so fascinating is the bell tower which was originally a minaret: a tower used for the Muslim call to prayer. The repurposing of the tower, now attached to the cathedral, displays the lengthy history of the city to visitors. As mentioned with the Alhambra, it’s a good idea to reserve tickets for both of these attractions in advance. Otherwise, prepare to get in line early. Above: Seville Cathedral is illuminated in stunning relief against the dark night sky. 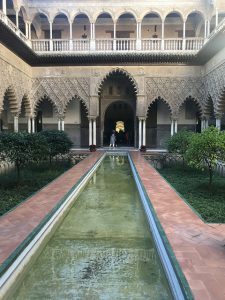 The famed building reflects Seville’s history of both Islam and Christianity. Gillian Redstone/The Miscellany News. Seville is also full of stylish people and unsurpassable shopping. But, more importantly, the food—be sure to taste traditional tapas dishes including croquettes, acorn-fed ham, oxtail stew and garlicky shrimp. Spain’s famous style of eating, drinking and socializing is especially ideal for anyone who struggles with choosing one dish from the menu. Indeed, Spain’s largest cities are home to the landmarks of Europe, from Prado to Sagrada Familia. However, taking a couple days to really understand a city, rather than quickly hopping from place to place, can allow for a more relaxed and immersive travel experience—and these Southern Spanish cities are worthy of a lifetime of exploration.